It’s Labor Day weekend and the fall season is in the midst. The 2014 NFL Football season is about to begin, as is the new Fall 2014 television season. As summer comes to an end, it’s time to put away the bright, cheerful shades of summer for darker, warmer fall and winter hues. While traditional fall shades of brown, gold, rust, orange and green are always popular year after year and never seem to go out of style, the hot colors of the season this year for both men and women are royal blue, aurora red, cognac, aluminum, bright cobalt blue, misted yellow, sea fog, cypress, radiant orchid and sangria. You’ll find many of these trend-setting fashion colors featured at luxury retailer The Watchery in many popular timepieces for men and women from Invicta, Cartier, Swiss Legend, Lucien Piccard, Perrelet, Chopard, Juicy Couture, LaCoste, Mulco, Stuhrling Original, and Tissot in both the watch dials and coordinating straps. 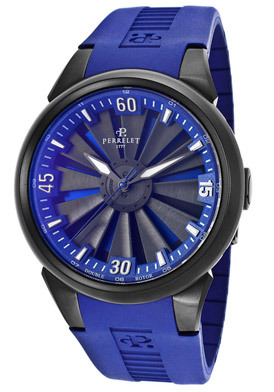 The Perrelet Turbine Automatic men’s watch offers a vivid display of cobalt blue, while the Salvatore Ferragamo Vara women’s watch casts a magical glow in diamonds and radiant orchid. The men’s Perrelet watch features exemplary Swiss-made automatic movement inside the lightweight, yet extremely durable titanium case. The vibrant cobalt blue rubber strap is attractive, extremely durable and has a butterfly deployment clasp for added convenience. The stationary titanium bezel encircles the captivating turbine dial with a cobalt blue outer dial, luminous hands and white baton markers and Arabic numeral quarter hour indicators. The built-in rotor mechanism on the turbine dial features a distinctive twirl movement. The exhibition skeleton caseback lets you see the intricate mechanical movement inside. 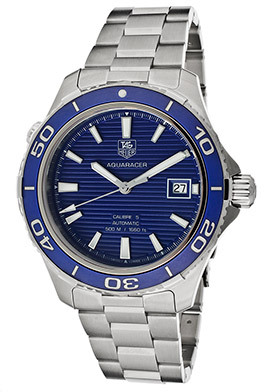 Automatic men’s watch is an impressive 44m in diameter, 13mm thick and is water-resistant to 50 meters. 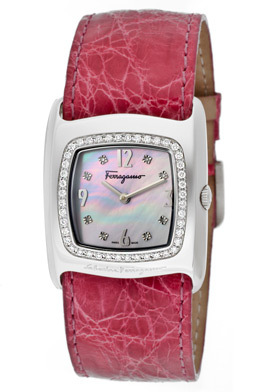 The Vara dress watch from Italian designer Salvatore Ferragamo features a lustrous, rectangular-shaped case in stainless steel, presented on a genuine crocodile strap in radiant orchid. Forty-four shimmering round-cut diamonds are pave-set to perfection on the square-shaped bezel. The pink Mother-of-Pearl dial glistens with polished silver tone hands and eight diamond hour markers. Features include quality Swiss-made quartz movement inside for precise time-keeping accuracy and water-resistance to 30 meters. Ladies’ watch is 30mm wide, 8mm thick and comes with two additional straps for added fashion options. Bell & Ross is a relatively a young watch company that is heralded and revered in horological circles today for their exemplary designed and precision crafted timepieces. 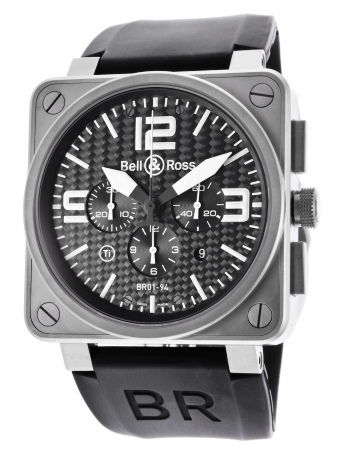 Founded in 1992 by designer Bruno Belamich and business entrepreneur Carlos Rosilo, Bell & Ross set out to create timepieces for professionals in extreme situations, namely pilots, astronauts, divers and bomb-disposal experts. The company looked to design watches for discerning professionals that met four fundamental principles: readability, performance, precision and water-resistance. Each Bell & Ross timepiece features highly accurate Swiss-made movements, clear visual indicators, the optimal water-resistance and distinctive functions for specialized use. The brand’s first BR timepiece was patterned after the shape of a cockpit instrument and instantly became a popular choice for pilots and astronauts. The BR02 diving watches offered highly legible dials and water resistance to 1000 meters, while the Hydromax models contained hydraulic fluid and were able to counteract external pressures. Many of the brand’s original models are still being produced today along with many newer models at their production facilities in La Chaux-de-Fonds, Switzerland. The technical exactness and utmost attention to detail in the design and production have remained unchanged for over 20 years. You’ll find all of the latest Bell & Ross watches at luxury retailer The Watchery, including the Aviation Men’s Automatic Chronograph watch. This expertly crafted Swiss-made timepiece features a strapping 46mm square shaped case in ultra-light and ultra-durable titanium. A high-performance black rubber strap adds to the striking good looks. The stationary bezel encircles the carbon fiber dial with three subdials, luminous sword hands, Arabic and baton hour markers. Features include an automatic date calendar, small-second and 30-minute and 12-hour registers. Chronograph is water-resistant to 100 meters or 330 feet. It features precise Swiss automatic movement inside and comes with an additional black canvas strap.